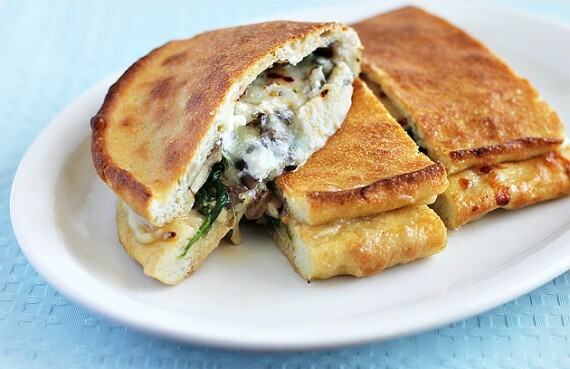 Calzones are actually a sort of inside-out pizza, filled with your favourite meats, cheese or vegetables. These moon-shapes delicious items look like a pastry but are far more stomach-filling than a regular desert or any appetizer. Making calzones at home serve multiple purposes, as you can fill them up with anything you desire and you are assured you are eating hygienic food made by yourself. Making Calzones at home have been made extremely easier since the dough used in their preparation is readily available at most food stores. However, you can also prepare the pizza dough at home and calzones from it but it will take a bit more time. Utensils: Mixing bowl, spoon, water jar, knife, serving plates. The initial step requires you to prepare the dough. Take a small mixing bowl and add a quarter pack of bread yeast to it. Add one cup of warm water to the bowl and mix the contents with a spoon. Once the contents in the bowl are thoroughly mixed, add 1 tablespoon olive oil, 1 teaspoon salt, 1 tablespoon sugar and a cup of flour to the bowl. Stir with the spoon and keep adding the remaining one and a half cup of flour to the mixture until the dough is formed. Knead the dough on a bread board for five minutes. Don’t forget to sprinkle some dry flour on the bread board before kneading. Put the dough in a bowl; add 1 to 2 teaspoons of olive oil to the dough and cover the bowl with a lid, allowing it to rise at the room temperature. Take another mixing bowl and add half cup of ricotta, shredded blue cheese and one tablespoon basil or oregano. Boil an average sized potato and cut it into small cubes before adding it to the filling mixture. You can add mushrooms, your favourite meat, vegetables or any other preferred ingredient you want to taste in the calzone to the mixture. Chopped onions, olives and a hint of pepper will certainly add up the flavour. Cover the bowl and put it in the refrigerator for at least one hour. Take out the dough you prepared. Divide it into two halves equally and place them on the bread board. Use a rolling pin to make flat, 8-inch circles of the dough. Use a spoon to place the filling mixture on one half of the dough circle and fold the uncovered half to make half-moon shape. Press down the round edges with a fork to form your first calzone. Do the same with the other calzone. Crack one egg in a bowl, beat it and brush it over the calzones. Bake the calzones in 375 degrees for 30 minutes and you will yield two large sized calzones to vanquish your hunger!